The Boeing 777 Freighter (777F), which entered service earlier this year, brings efficiency to long-haul operators while offering the advanced features of the 777 family. Designed to fill the need expressed by cargo operators around the world, the 777F is an efficient, long-range, high-capacity freighter. By providing more capacity than any other twin-engine freighter, the 777F brings new levels of efficiency to the long-haul market. The range capability of the 777F provides significant savings for cargo operators. It enables them to take advantage of fewer stops and associated landing fees, less congestion at transfer hubs, lower cargo handling costs, and shorter cargo delivery times. The new freighter also integrates smoothly with existing cargo operations and facilitates interlining with 747 freighter fleets. This article provides an overview of the 777F, including its heritage, freighter capabilities, range and capacity, twin-engine design, and ability to fit into existing cargo operations. Launched in May 2005, the 777F inherits the same basic design and flight charac­teristics of 777 passenger airplanes but is designed specifically to transport cargo. It also shares many of the 777 family’s advanced features, such as a fly-by-wire design, an advanced wing design with raked wing tips, and a state-of-the-art flight deck (see fig. 1). It is powered by the world’s most powerful commercial jet engine, the General Electric GE90-110B1. 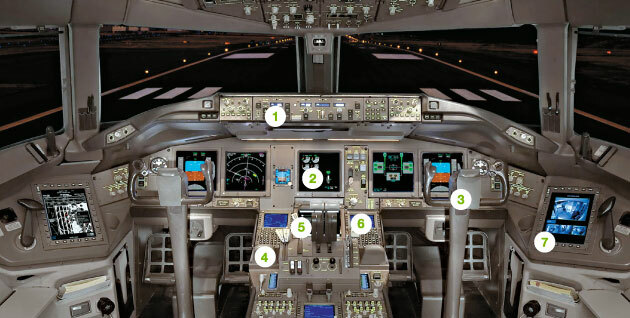 The 777F flight deck will be familiar to crews that have flown 777 passenger airplanes. New monolithic aluminum floor beams. Rigid cargo barrier located in the forward section of the airplane. Strengthened fuselage, especially in the area of the main deck cargo door. Enhanced, lightweight cargo-handling system with built-in test equipment that continually monitors the operational health of the system. An advanced maneuver load alleviation system that redistributes the aero­dynamic load on the wing during non-normal flight conditions, reducing the load on its outboard portion (see fig. 2). This allows the 777F to operate in a wide variety of flight environments without compromising payload capability. The 777F also features a new super­numerary area, which includes business-class seats forward of the rigid cargo barrier, full main deck access, bunks, and a galley (see fig. 3). The airplane’s design reflects information and feedback that Boeing gained at freighter working group meetings held with 20 air­lines and cargo operators. 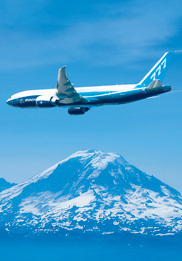 Boeing’s plan was to ensure that the 777F would operate with procedures and handling similar to other 777 variants. The result is a common type rating with 777 passenger airplanes and only minimal transition required and lower training costs. The 777F is based on the 777-200LR (Longer Range) but designed specifically to transport cargo. The supernumerary area includes business-class seats forward of door 1. With a maximum takeoff weight of 766,000 pounds (347,450 kilograms), the 777F has a revenue payload capability of more than 226,000 pounds (102.8 metric tons). It can fly 4,880 nautical miles (9,038 kilometers) with a full payload at general cargo market densities (more than 10 pounds per cubic foot), making it the world’s longest-range twin-engine freighter (see fig. 4). The airplane has been engineered to have essentially the same landing charac­teristics as the 777-200LR (Longer Range), despite a maximum landing weight that is nearly 17 percent heavier (575,000 pounds; 260,810 kilograms). The 777F accommodates 27 standard pallets (96 by 125 inches; 2.5 by 3.1 meters) on the main deck. The industry-standard 10-foot-high (3-meter-high) pallets are accommodated by the large main deck cargo door. The lower cargo hold has the capacity for 10 pallets, as well as 600 cubic feet (17.0 cubic meters) of additional bulk cargo (see fig. 5). The 777F can fly 4,880 nautical miles (9,038 kilometers) with a full payload at general cargo market densities, opening up new nonstop markets to cargo operators. The ability to accommodate 27 standard pallets on the main deck, combined with a versatile lower hold, gives the 777F a capacity never before available on a twin-engine freighter. The 777 family has an established history of twin-engine efficiency, with lower fuel consumption, maintenance costs, and operating costs. The 777F extends these advantages to cargo operators, giving them the lowest trip cost of any large freighter, as well as excellent ton-mile economics. The freighter is expected to offer a 17 to 28 percent fuel-per-ton advantage to other freighters. The 777F has range, payload, and operating economics superior to any existing airplane freighter. Its fuel economy also provides environmental benefits because lower fuel consumption means lower carbon emissions. The 777F also meets London-Heathrow noise standards (QC2) for maximum accessibility to noise‑sensitive airports. The high commonality of 777F airplane systems — such as flight controls, hydraulics, and landing gear — with 777 passenger airplane systems takes advan­tage of existing maintenance infrastructure (i.e., parts, ground support equipment, task cards, training) at the airline operator. The 777F has been designed to integrate smoothly with existing cargo operations and facilitate interlining with 747 freighter fleets. Cargo operators can easily transfer 10-foot-high pallets between the two models via the large main deck cargo door. The 777F is Boeing’s response to strong demand from cargo operators around the world for an efficient, long-range, and high-capacity freighter. By providing more capacity than any other twin-engine freighter, the 777F brings new levels of efficiency to long-haul markets. At the same time, its similarity to previous 777 models and ability to facilitate direct-transfer shipments with 747 freighter fleets make it easy to integrate into an operator’s fleet. For more information, please contact Jason Clark at jason.s.clark@boeing.com or Ken Kirwan at kenneth.d.kirwan@boeing.com.